We are the Oblates of St. Joseph, a religious order of priests and brothers founded by St. Joseph Marello in 1878. It was his inspiration to gather together a group of young men who desired to consecrate themselves to the love and service of Jesus in imitation of St. Joseph. He envisioned a family of priests and brothers living lives of of chastity, poverty and obedience, in imitation according to the humble and hidden example of St. Joseph. In the United States of America, our Province is united under the patronage of the Holy Spouses, Mary and Joseph. The road to become an Oblate of St. Joseph is full of joys and blessings for the men who respond with an open heart to their vocation. Join us in the next few paragraphs as we describe the various stages and steps of self surrender and commitment that each Oblate must take… The steps of formation for an Oblate of St. Joseph include the following major phases. After a candidate has been accepted to enter the Congregation of the Oblates of St. Joseph, he starts to live in an Oblate house and begins to experience the Oblate life of prayer and community. This period, called Aspirancy, lasts six months to several years and consists of a sharing in the Oblate life with guidance by an Oblate priest or brother who can help the candidate to learn more about the charism of the Oblates of St. Joseph. He also begins to understand better the rigors of religious life. 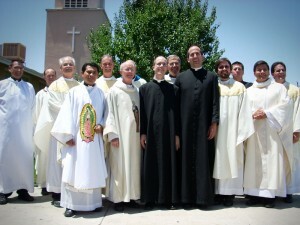 During this period, the candidate makes no commitment to the Oblates of St. Joseph, but simply shares in their life in order to know more clearly if he is being called to the same community.It is common during this period for a candidate to continue studies in the undergraduate or graduate level, deepening his knowledge in preparation for further studies and fostering good habits and discipline in his personal life. When the candidate and the Oblates feel ready, he can request to be admitted to the next phase of formation, called postulancy. In the phase of formation called Postulancy, the candidate deepens his efforts to discern God’s vocation for him. He learns more about the Oblates of St. Joseph, about their founder St. Joseph Marello, and about the lifestyle for which he is preparing himself. Upon entering into this stage, the candidate is known as a “postulant,” a person who has felt God’s call to religious life and who now wishes to intensify his knowledge of the religious Congregation. 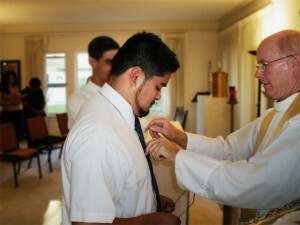 Once admitted, the postulant wears a medal of St. Joseph as a symbol of the call he feels to enter the Congregation of the Oblates of St. Joseph.The period of postulancy gives the candidate an opportunity to grow in the human and spiritual qualities necessary to proceed to the next step in formation. Through prayer and dialogue with his superiors, he discerns whether God is calling him to be a brother or to pursue priestly studies and ordination. He shares in more aspects of the life of the Congregation, and he begins to leave behind more of his previous way of life, in favor of becoming an Oblate of St. Joseph. During this period, the postulant will continue to hone the intellectual and human skills that God has given him in order to put them at the service of the Church and his community. Postulancy lasts between six months and two years. 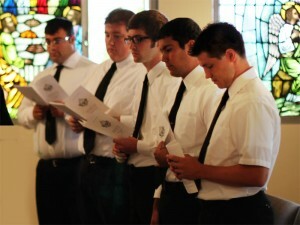 After being prepared for the next phase of formation, the postulant petitions to enter the novitiate. The Novitiate is a period designed to prepare a candidate to profess the vows of poverty, chastity, and obedience. During this stage the man becomes a “novice.” The beginning of the novitiate is marked by the reception of a crucifix as a sign of the life of self-sacrifice he chooses. He also begins to dress according to a distinct habit that represents the life of simplicity and discipline that characterize the religious life. For twelve months, the novice is guided by a Novice Master, an Oblate priest whose sole task is to help the novice completely open himself up to God’s will for him. 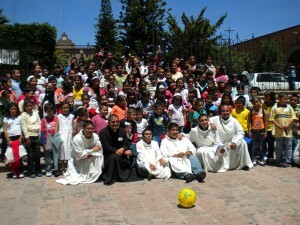 The Novitiate is a delicate balance of prayer, study, work, and play. In this continual rhythm of life, the novice discovers the challenges and joys of religious commitment, and is strengthened in his resolve to commit his life to Christ by the profession of the evangelical counsels, the vows of chastity, poverty, and obedience. After having completed his novitiate and being judged ready by his Novice Master, the novice requests permission to make vows in the Congregation of the Oblate of St. Joseph. 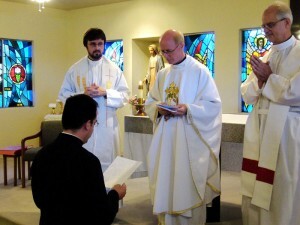 His first profession of vows is a commitment he makes that is binding for one year. Although it is still a period that does not entail a permanent commitment for the candidate, he is able to experience fully the beauty of the consecrated life and the joys of the evangelical counsels, as well as sharing fully in the community life of the Oblates of St. Joseph. At the end of each year of temporary vows, the Oblate must renew his vows in the Congregation, again for another one year period. The period in which an Oblate is in temporary vows lasts for at least three years, though sometimes these perpetual vows are renewed for more. When the candidate is ready, he requests to be admitted into perpetual vows. When a candidate has successfully completed all of the preceding stages and feels ready to commit his life to be an Oblate of St. Joseph, he petitions the Congregation to be admitted into perpetual vows of poverty, chastity, and obedience. By this profession he becomes a member of the family of the Oblates of St. Joseph for his entire life. The brother who professes perpetual vows gives his life in service of Christ and his Church as an Oblate of St. Joseph. His decision to follow Christ by his commitment to his religious life is itself an incredible witness and source of joy. Although some Oblates are called by God to be ordained to the priest, it is important to recognize that the religious life is complete in itself by the profession of vows. That is, the Oblates of St. Joseph do not consider their priestly members a “fuller” expression of a consecrated vocation, but see in the profession of perpetual vows a vocation that remains complete for those God calls. Many Oblates are also called to live out their religious consecration by serving as priests.In this case, the Oblate fulfills the normal course of priestly studies during his formation through the period of vowed religious life. Oblate priestly candidates receive an education in philosophy and theology, as is required for all candidates to the priesthood. After successful completion of studies and after profession of perpetual vows, the Oblate called to priestly ministry will be ordained a deacon and later a priest. His religious life remains fundamental to his priestly ministry. He continues to live in community, to live his vowed life of chastity, poverty, and obedience, and to give a positive example to the world of his love for Jesus in imitation of St. Joseph. Although his ordained ministry will demand different apostolic works of him from his non-ordained brothers, the Oblate priest always embraces the communal life and the joy of being an Oblate of St. Joseph.